The e-Learning Sudan project is another innovation project that showed promising outcomes in 2013. 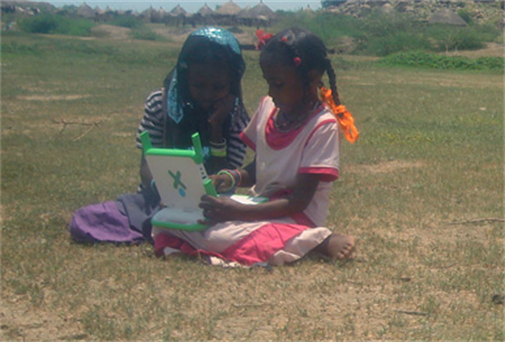 The project uses a specially designed computer game to bring alternative learning opportunities to Sudanese children who are excluded from traditional schooling. Through the use of web-based learning, laptop computers, solar power, wireless technology and local and remote support, the project aims to overcome the limitations of traditional schooling and inadequate resources and enable vulnerable children to acquire the national Certificate for Primary Education. In 2013, review of a six-week pilot period involved sixty-six children in three remote villages and a control group of twenty children in a fourth community who participated in oral mathematics pre- post-tests to assess their progress. Preliminary results show a significant increase in the test scores of participating children, from an average of 19.4/60 on the pre-test to 38.4/60 on the post-test, an increase of nineteen points that was not observed in the control group. All children in the three pilot groups scored better on the post-test, with the children who scored lowest on the pre-test making the greatest progress.